To little surprise, ABC has decided to pass on ordering additional episodes of Pushing Daisies. After a critically-acclaimed and ratings-challenged run, will faithful viewers get some closure? 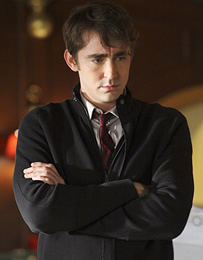 Pushing Daisies follows the story of an unusual pie-maker (Lee Pace) who can bring people back from the dead. With the help of his previously-deceased girlfriend (Anna Friel) and his detective partner (Chi McBride), the trio solve mysteries by briefly reanimating corpses and asking them questions. Other characters are played by Kristin Chenoweth, Swoosie Kurtz, Ellen Greene, and Jim Dale (the show’s unseen narrator). Daisies debuted in October 2007 and, though the ratings weren’t good by the end of the first season, ABC renewed the show for a second year. The network execs hoped the show would catch on with a larger audience in season two. It didn’t and has only averaged six million viewers each week. Last night’s episode marked a series low in the ratings. As a result, ABC has opted not to order any additional episodes. The network has avoided saying that it’s actually cancelled the show. The series could possibly return at a later date but, considering Daisies’ ratings track record, that is highly unlikely. More likely, the network is trying to avoid backlash from devoted and disappointed fans. The reason for leaving viewers without a conclusion is somewhat of a mystery since producers were told in advance that this would likely be the final installment. For whatever reason, season creator Bryan Fuller decided to go the way he did. Filming an alternate ending was considered too expensive a proposition considering the show’s extremely tight budget. If the network does pull Daisies before all of the episodes have aired, they’ll certainly be released on DVD at some point. Fuller has also said that he has plans to continue the tale of Ned the piemaker and friends in comic book form, likely with DC Comics. Fuller says he’s already in talks with the publisher and has a movie idea ready to pitch as well. Though there won’t be any new episodes, it doesn’t look like these characters will be going six feet under any time soon. Stay tuned! It’s been one of the best shows ever in tv and surely the best coming from America since X Files!! !